An activity older than Pirate Cove its self. Going right back to when Bluewater first opened and Blue Boats roamed the waters; Pedalos were the favoured mode of sea travel for all who sail our mysterious lake. Now newer, redder, more sparkly boats sail the seas at Pirate Cove and they’re still a favourite- rain or shine people pedal their way to the end of our ocean and back. Sailing a Pedalo is takes a lot of concentration and team work; both peddlers need to work as a team to keep things running smoothly or else you might just find yourself bobbling along as slow as the ducks. Now if you don’t fancy all that work; and to be honest in this heat I don’t blame you, our four electric boats are perfect. You’ll be scouring the seas for mermaids in no time, with minimal effort. New to Pirate Cove, as of last year, the electric boats have been a major hit. With their shark decorate sides and large size they are great for families with kids. Plus, the ease and smoothness makes a romantic date for any couple. With only one other place in the UK using these boats you’d be a fool to miss out! They’re fun for everyone without the work! What’s not to like? Our leisure boat operators work hard to make sure your experience is a great as possible from the minute you step on the boat to when you land back on dry shores. They have dealt with plenty of nervous sailors and are always happy to answer any questions you have! How much does a boat cost? A ride on a Pedalo costs £13.50 and an on the Electric Boat costs it costs £18.50 – this is non-dependent on the amount of people in the boat. How long is a boat ride for? Each boat ride lasts for 30 minutes. How old does someone have to be to ride a boat? Any age can get on a boat but any scallywags under the age of 12 must be accompanied by a buccaneer over 18. Could I fall in the lake? This is extremely rare, and I have only seen it happen once. As long as you follow the rules you won’t end up in the lake. However if you do, don’t panic. Our leisure boat staff are well trained in what to do and are patrolling the lake at all times. You’ll also have a life jacket with a whistle for emergencies. But no need to worry as all of the boats are extremely safe and you’re guaranteed to have tons of fun! So now you know everything you need to about the range of boats we have to offer here at Pirate Cove. Whether you’re pedalling your way around or fancy a leisurely sail, we’ll be ready for anything! Keep an eye out for the wild life living in our lake. We have lots of ducks, swans and fish swimming around. If you look carefully you may even spot a mermaid or two. 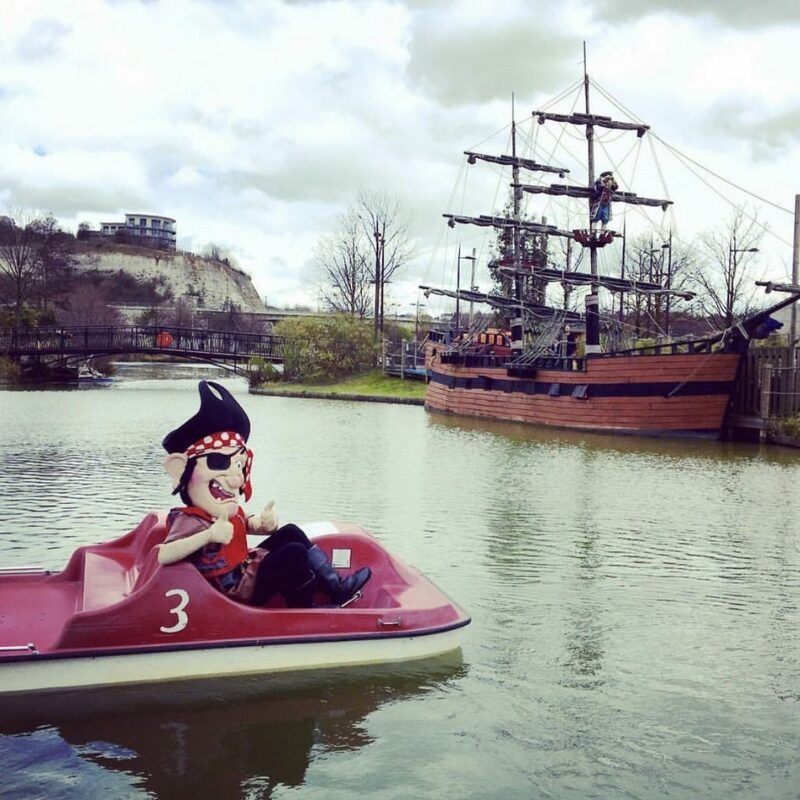 From the 21st July the boats will be open every day till 6pm so there’s plenty of time for an adventure. Even if you can’t wait that long the boats will be open from 4 – 6pm for the rest of this week.